AutoNation already has $15 million worth of its own line of aftermarket collision parts on hand to sell the industry, and the dealership chain’s approximately 80 collision centers were expected to have access to them last month, according to a May 1 earnings call discussing the initiative. AutoNation customer care and brand extensions Executive Vice President Scott Arnold said on a Feb. 1 earnings call he was “excited” to announce the launch of the imitation parts line. Arnold said Feb. 1 four operational AutoNation aftermarket collision parts distribution centers had opened, and two more expected to be ready by the end of March. “We will continue to expand our distribution network to support our national wholesale footprint, creating more opportunities to offer both OEM and AutoNation collision parts to all of our wholesale customers,” Arnold said. He said he expected this and other brand extension efforts in AutoNation’s customer care segment to yield $100 million in gross profit throughout 2018, starting slowly but then accelerating. Asked if AutoNation was creating an LKQ model of selling to the broader marketplace, Arnold said he wasn’t sure that description fit. “What we are doing is aligning ourselves with those wholesale operators that buy OEM parts,” he said then. The idea was to be able to sell aftermarket parts alongside OEM components, he said. “The insurance companies dictate the percentage of aftermarket parts versus OEM part, and … now we have an opportunity to offer both,” he said. He reiterated in May that AutoNation was “certainly lining ourselves up to meet the insurance industry’s demand for those parts” and setting up the infrastructure to distribute parts into the “OE parts wholesale” sourced by outside customers and the company’s own 80 collision centers. The company also sells mechanical AutoNation-branded aftermarket parts, Arnold confirmed May 1. 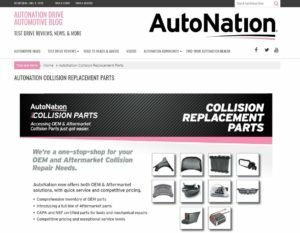 An ad posted on the AutoNation blog states the company has “CAPA and NSF certified parts for body and mechanical repairs” and displays components like a fender, bumper cover and hood. It also states that the company has “High-quality OEM parts backed by limited lifetime warranties” but doesn’t elaborate on the protection for the aftermarket parts. Arnold on May 1 said AutoNation had $15 million in inventory for the aftermarket collision parts business. He said the company tied its supply chain to Taiwan, “where more of the aftermarket collision parts are generated from,” he said. AutoNation CEO Mike Jackson said he thought the company was “in a unique position when we talk to vendors and suppliers,” whether on collision parts or service contracts. “We have the scale to negotiate very good pricing, we understand the quality that we want, and the suppliers and the vendors are absolutely thrilled and happy to talk to us, … and there’s great acceptance of the AutoNation brand on the consumer part,” Jackson said. It all was “going extremely well,” though AutoNation faced “execution issues” as it was “complex to make this all work,” according to Jackson. Jackson said AutoNation’s collision center and collision parts inititaves proved “extremely exciting” in that spending in inventory and infrastructure delivered sales and gross margin improvement. “There’s a lot of instant gratification,” he said. AutoNation Chief Financial Officer Cheryl Miller said Feb. 1 she expected the first quarter selling, general and administrative expense as a percentage of gross profit elevated at about 75 percent over initiatives like the launch of the initial phase of the aftermarket parts business — which she said would be in place by the second quarter — and also the timing of stock compensation costs. However, she said the company expected the full-year SG&A as a percentage of profit to ultimately equal 2017’s. Her predictions largely came true. Miller on May 1 reported that SG&A as a percentage of gross profit came out to 74.4 percent for the first quarter, up 1.8 percentage points over a year ago. She said it was largely driven by brand expansion efforts including the new aftermarket collision parts business, and AutoNation still expected SG&A to be flat year-over-year. He said he argues to them 10 years ago, new vehicle sales posted a 8-9 percent front-end gross on a cost of 4-5 percent. Today, the front-end gross was 5 percent, it was nearly a “‘commodity pass-through business'” to sell new cars, and AutoNation had to make all of its profit somewhere else. He said he also told OEMs “‘it’s your stair-step'” and margin program that drove AutoNation to this, and “‘you’re quite delighted'” to see the gross margins down to 5 percent. AutoNation had spent money on its facility, and “I need a way to grow,” he said he told OEMs. “‘A lot of business'” sent to the OEM in the past was “‘only'” done for relationship purposes, and it no longer makes sense with a gross of 5 percent, he explained to the automaker. In other collision-related news, Jackson said AutoNation’s collision centers grossed $33 million in the first quarter, up 6 percent from January-March 2017. It was unclear if he was referring to same-store sales or the overall gross, but Arnold in February said same-store sales in the fourth quarter of 2017 rose to $32 million, up 8 percent from Q4 2016. The company had built or bought eight new collision centers in 2017 for a total of 76 by the end of the year, and it planned to purchase or construct at least 10 more in 2018, Arnold said.